The second entry flight for the World Series of Poker Main Event has come to an end after five two-hour levels. This is arguably the most prominent event of the year anywhere in the world; a win here is one of the most sought-after titles in the game. At the end of play, an unknown player by the name of Trey Luxemburger was leading the pack with 193,450 chips — a few thousand less than Day 1a’s chip leader, Martin Jacobson with 200,100. Day 1b saw 2,144 players sit down in a $10,000 seat with 30,000 chips and aspirations of being the player to collect the $10 million that is guaranteed for first place at the end of it all. The field was almost triple the size of Day 1a’s, and the final day to enter — Day 1c — should see comparable numbers. The total player count is now at 2,915. You will recognize Mark Radoja from his win in 2013 WSOP Event #16: $10,000 Heads-Up No-Limit Hold’em. That was his second bracelet; his first came in 2011 in a no-limit hold’em shootout event. He also has four cashes to his name already at this summer’s WSOP. Noah Vaillancourt should be a familiar face as well. He has had final tables at the WSOP, PokerStars Caribbean Adventure, and won the 2012 Spring UltraStack Main Event at Edgewater Casino in Vancouver. 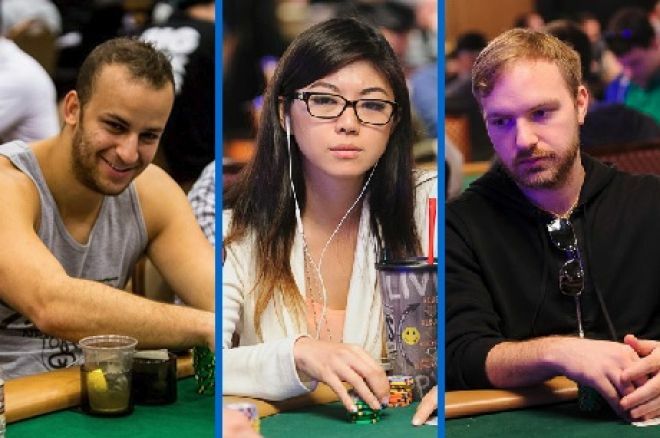 Other notable Canadians with chips in bags from Day 1b include 888poker Team Pro Xuan Liu (69,075), WSOP bracelet winner Scott Montgomery (68,750), the well-accomplished Sorel Mizzi (62,000) who we recently wrote a profile of in anticipation of his inevitable WSOP bracelet one of these days, the similarly-accomplished Mike “SirWatts” Watson (30,625) who finished second in Event #58 just over a week ago to add to his four other WSOP cashes this summer, one of the powerful trio of brothers — Sam Greenwood (29,850) — looking for his fourth WSOP cash of the summer, online tournament crusher Jonas “donut604” Mackoff (20,000) who is finding tremendous success on the live felts as well with six WSOP cashes this year, and Jason Mann (13,900) who made a great run in this event last year when he finished 25th. That makes the Canadian contingent 72 players strong from Day 1b — a total of 97 for the Main Event so far when you add the 25 from Day 1a. There were a few other noteworthy Canadians who weren’t able to make it through their first day on Sunday. Yann Dion, Max Greenwood, Eric Afriat, Peter Jetten, Mike Leah, Timothy Adams, and Ami Alibay all entered and exited Day 1b. To get the most current updates on all of the action, follow the PokerNews live reporting blog. We will also have another daily recap for Day 1c when the full chip counts are made available. WSOP What to Watch For: The Main Event Has Arrived!